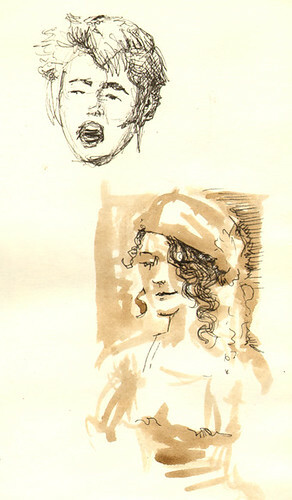 So it turns out that, every Monday night the charming town of Eugene, it's Muse Arts Night at a local coffee shop. 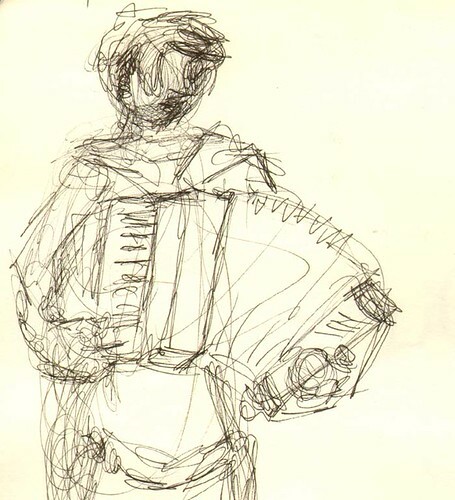 Musicians come out to play and a gaggle of artists drop in to sketch them as they perform. Got wind of it because one of my favorite local bands, Aeon Now, was performing this past Monday and put the word out on their mailing list. 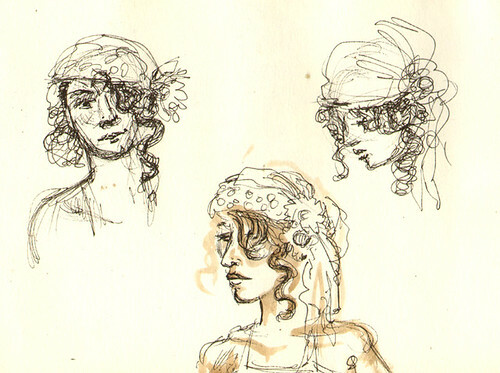 I threw some pens and a sketchbook in a bag and biked on over! 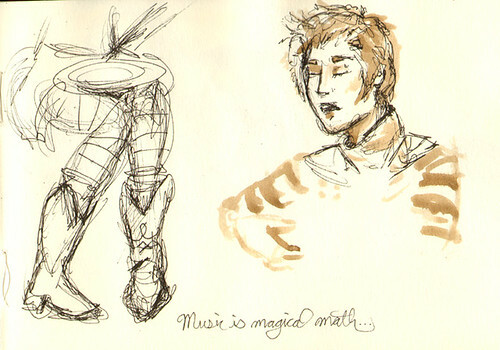 Here follows a note about the quirky workings of my brain. 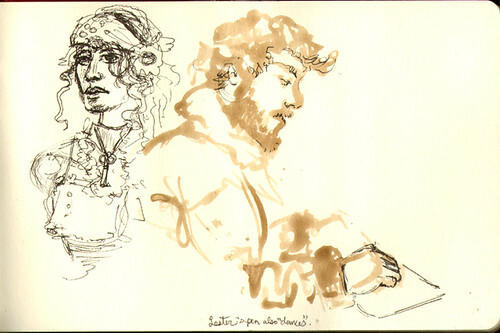 When I was in high school, I would sketch actors at the local Renaissance Faire as they performed Shakespeare on stage. I would get very focused on the drawing, working fast to try to keep up with the motion on stage, and I invariably found myself reciting the lines of Midsummer Night's Dream along with the actors without even fully realizing that I was doing it. It's like my right brain (visual/scribbly) and my left brain (verbal/wordy) were simultaneously highly engaged in the action, and it was incredibly fun. 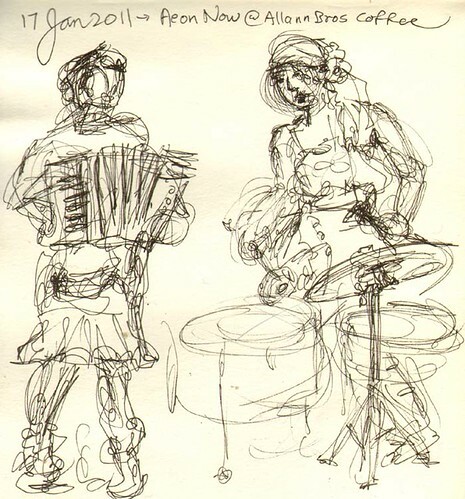 Well, I was getting a similar dose of that level on fun while drawing Aeon Now--had to work to not audibly sing along with the band, and Olive (the accordion player) was highly amused to watch me trying to dance and draw at the same time! I was chatting with the super-talented botanical illustrator Kathy Garness yesterday and mentioned how I am keeping the verbal side of my brain busy during my current stippling project by playing a language learning tape while I draw. She confessed that the most productive she's ever been while stippling is while talking to a good friend on the telephone--again, the verbal side of the brain is engaged while the visual side works out all the spacial relationships between the little dots on the page. So yes. I like to think that the artsy half of the brain is more productive when the wordy half of the brain has a chew-toy, so to speak. Whether it's Shakespeare, or music with excellent lyrics, or basic phrases in the Polish language, keeping both hemispheres of the brain engaged seems to make for maximum fun.